in particular, the many times I do not feel peaceful. when I am afraid of what the future holds. upon my acceptance of salvation. I know that in my heart, so why don't I always experience this peace? need to prepare ourselves for battle with the enemy. One part of that armour that I've never paid much attention to until recently is the footwear. Paul says, "our feet need to be fitted with the readiness that comes from the gospel of peace." 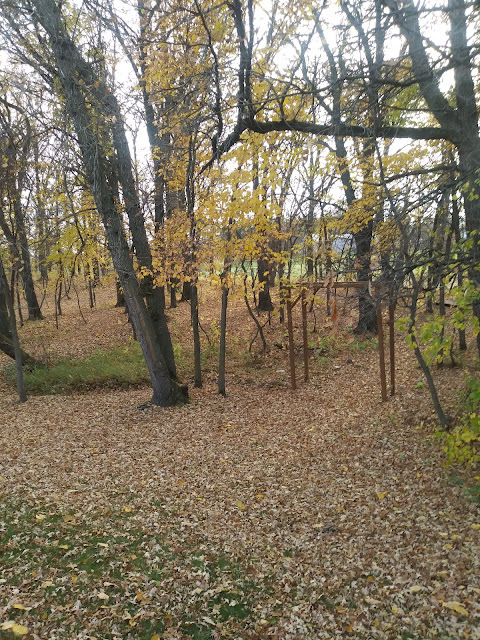 we don't want to slip and fall thereby providing the enemy a way through our defense. So what does peace have to do with battling the enemy? When I am discontented, anxious, or fearful my state of mind and heart is far from peaceful. In fact it is a good indication that the enemy is making a successful assault on my life. I may have peace with God but I am not experiencing the peace of God. Whose mind is stayed on You. Because he trusts in You." How do I keep my mind stayed on God? How do I access the peace God promises? and unifies us as believers. For flash back Friday I'm bringing back this recipe for pumpkin donuts. We bought a number of pumpkins from a 'pumpkin farmer' last week. I baked and pureed them. There is nothing like fresh pureed pumpkin. It freezes well, I thaw it in a sieve over a bowl to remove most of the liquid. I still have a few pumpkins to bake and puree. I like to be stocked up for winter. In a mixing bowl beat eggs, sugar, and butter until creamy. Combine both flours, baking powder, baking soda, salt, cinnamon, nutmeg, and add to pumpkin mixture alternately with milk. 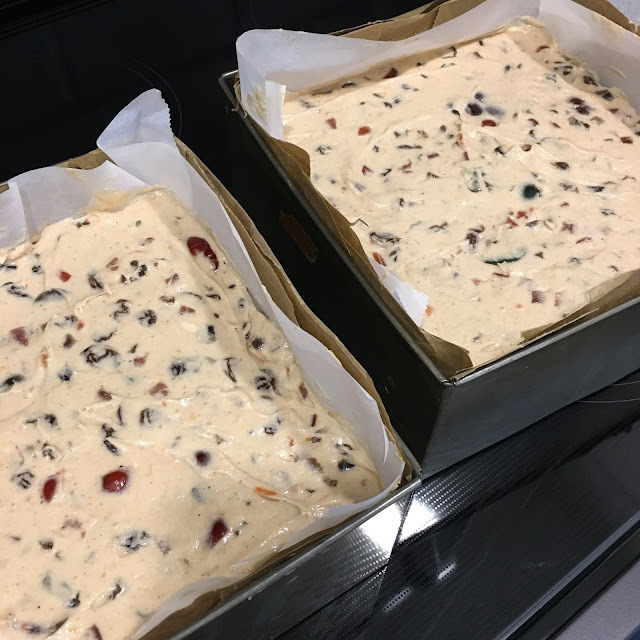 Cover and refrigerate for 2 hours or overnight. Turn onto floured surface and knead 5 or 6 times using extra flour as needed but the dough will still be a bit sticky. Only use enough flour to roll out your dough that it doesn't stick to your surface. Roll dough to approx 3/8" thickness and cut with a donut cutter. Place cut donuts on cookie sheets until ready to fry. I like to spray the cookie sheets with cooking oil before placing donuts on them so they don't stick when you lift them to place in your hot oil. In a skillet heat oil to 375º. I test to see if it's hot enough by putting a 'donut hole' in the oil and if that rises to the top immediately you know the oil is hot enough. Fry donuts, a few at a time until golden, approximately 3 minutes, turn once and remove with slotted spoon and drain on paper towels to soak up excess oil. Once cooled spread donuts with your favorite frosting. This time I used buttercream frosting with maple favoring. Top with sprinkles of toasted pecan bits. Crushed peanuts or toffee bits sprinkled on top is also delicious. Foil packet dinners are easy to prepare and clean-up, and are not just for camping; they can be baked in the oven year-round. Cabbage and sausage were meant to be paired, and here is a simple and tasty way to serve them up for dinner tonight. Prepare 4 pieces (12" x 18") of heavy-duty foil. Divide cabbage wedges, potatoes and sausage slices evenly on the four pieces of foil. Top each mound with a dollop of garlic butter and season with salt and pepper. Bake for 1 hour, or until veggies are tender. 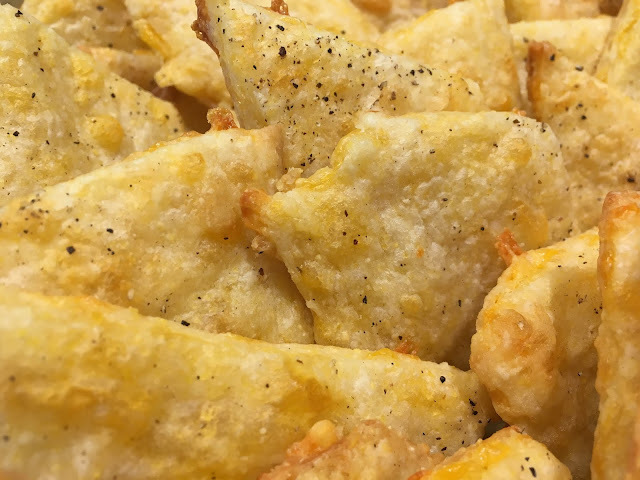 It's the time of year where it's nice to bring out a few extra snack ideas. I received this recipe years ago from a friend and always loved it, but you know how it is, things get shuffled around and l lost it. Thanks, Hilda for sharing this recipe with me again. It's tasty, simple and easy to make and I don't think you will have any leftovers. Mix flour cornmeal, baking soda, sugar, and salt into large mixing bowl. Cut butter into mixture till it resembles coarse crumbs. Using a fork, stir in grated cheese, vinegar, and cold water just until mixture forms a soft dough. Roll dough out on lightly floured surface, paper thin. Sprinkle with pepper and roll the pepper into the dough. Cut into whatever shape you want. Jagged edges add character. 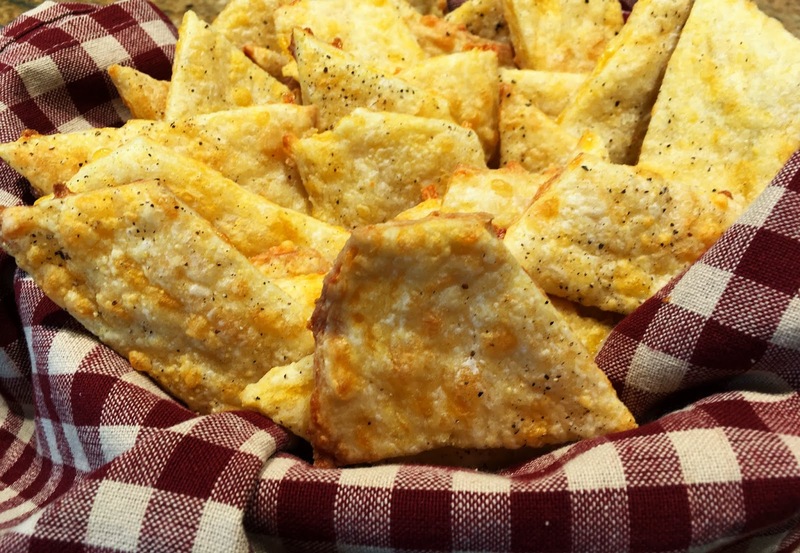 Bake cheese crisps for about 10 minutes or until brown and crisp. Remove to wire rack to cool and store in a tightly covered canister. I LOVE these cookies. Even my husband who is not a cookie lover reached for the second one! Put softened butter, sugars, cream cheese in bowl of mixer and beat until fluffy, Add egg and beat well. Mix dry ingredients together and mix into butter mixture. 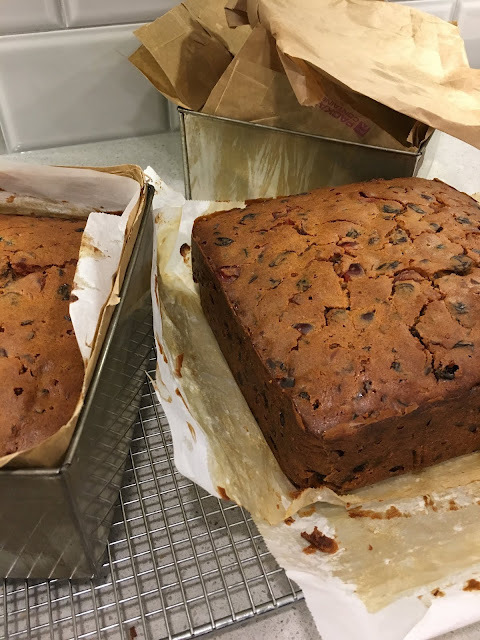 Chill for a few minutes - can keep in fridge for a day or two but will then need to be warmed to room temperature to soften again. Drop by teaspoon into parchment-lined cookie sheet and bake at 350 degrees F for 11 minutes. These cookies keep well . 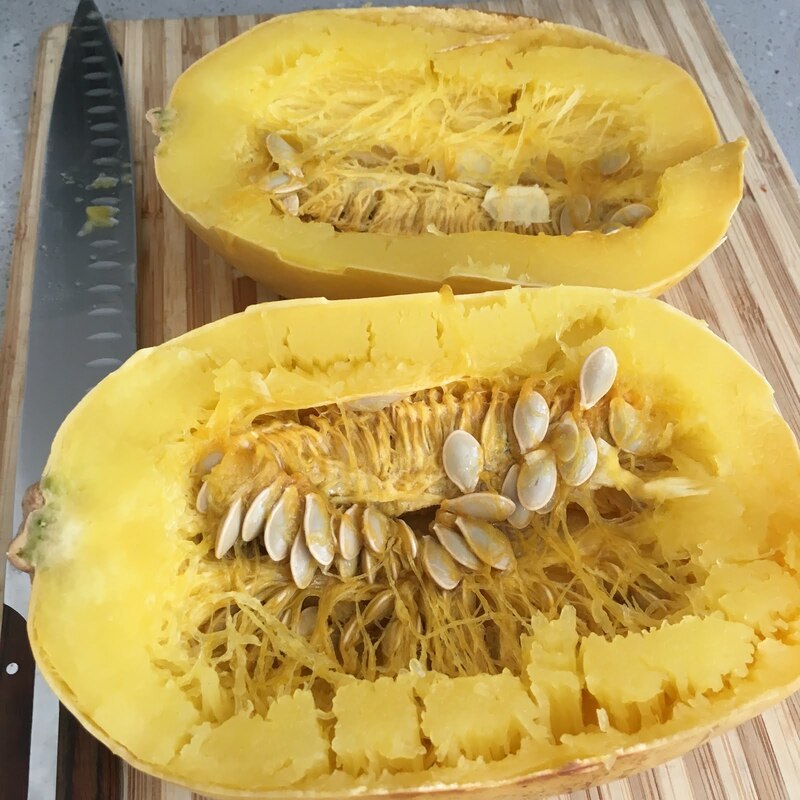 If you are anything like me you find cutting into a squash difficult and hope to not get a good cut in the process. 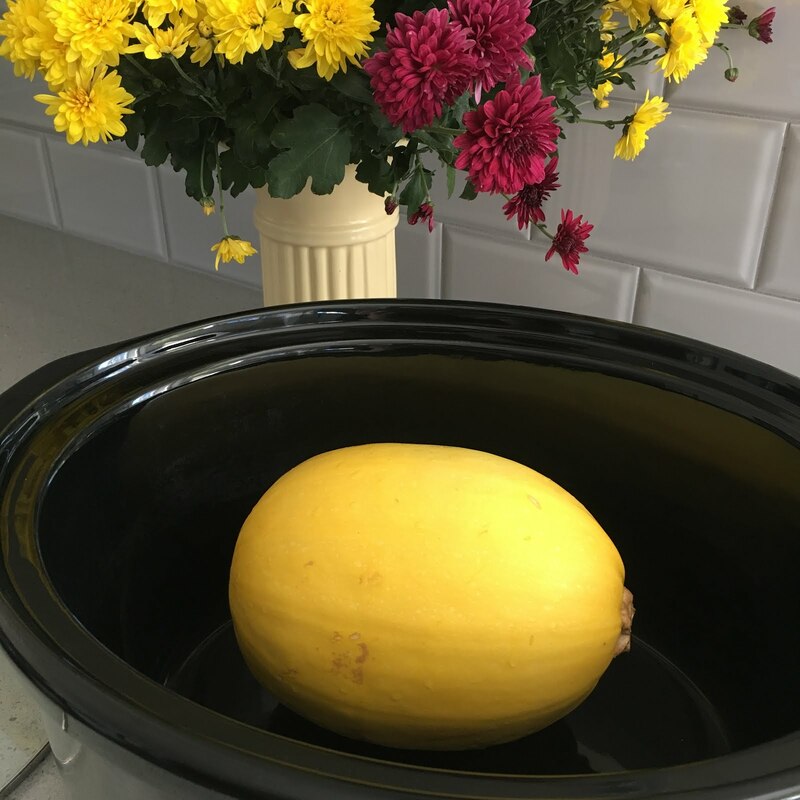 This fall my sister Rhoda gave me the wonderful suggestion of baking a spaghetti squash whole in a crock pot. 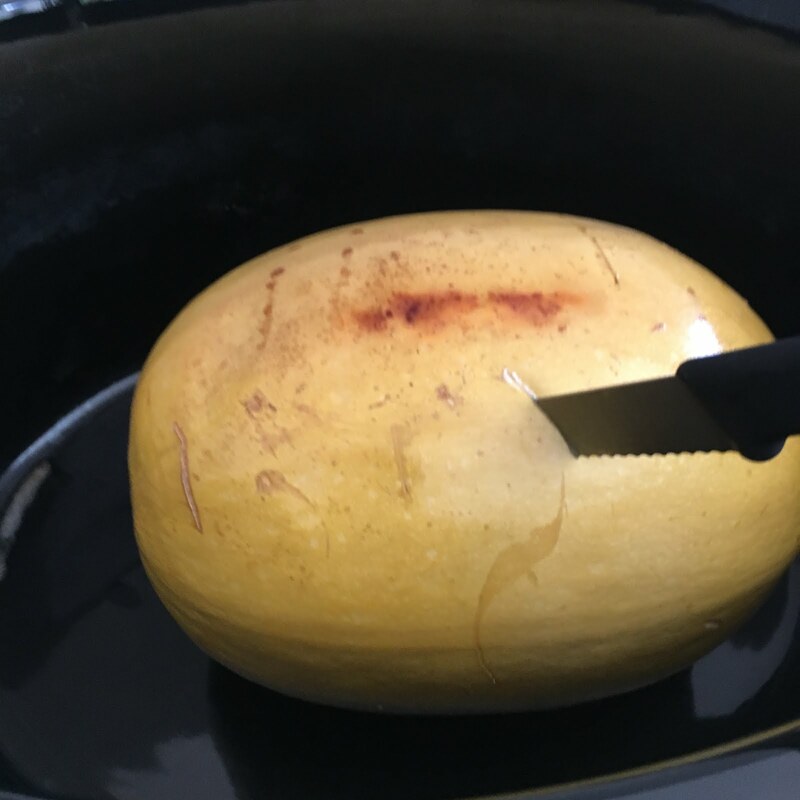 All you have to do is poke a knife into several places as you would a baking potato and place it into your crock pot. Turn it onto high and let it cook for 2-4 hours depending on the size. The one pictured took 2 1/2 hours. To test if it's done insert a knife. It will slide in very easily when cooked. It's very hot so you will have to be careful and lift it out with 2 pot holders as it's also a wee bit soft. Place on cutting board. Using a long sharp knife you will now we able to easily cut the squash in half. While it's still hot scoop out all the seeds and pulp and discard. Take a fork and pull the spaghetti like strands away from skin. You can leave it in the shell to serve or scoop into a bowl. 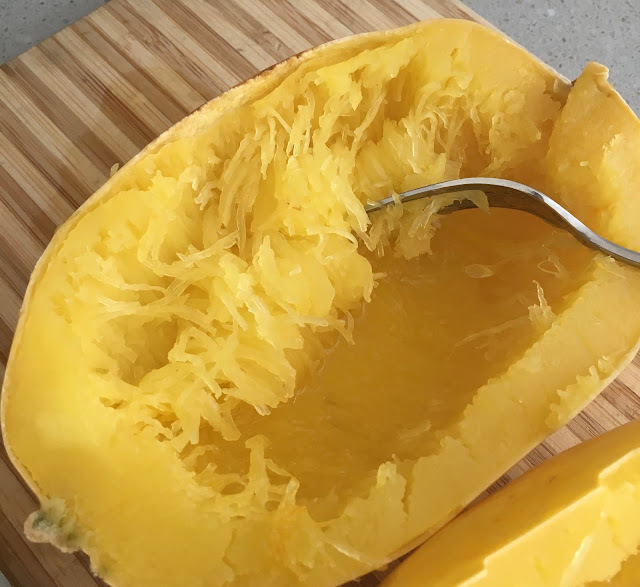 Eat plain, or with a wee bit of butter, salt and pepper, or here is a very tasty way to add some great flavour to spaghetti squash. 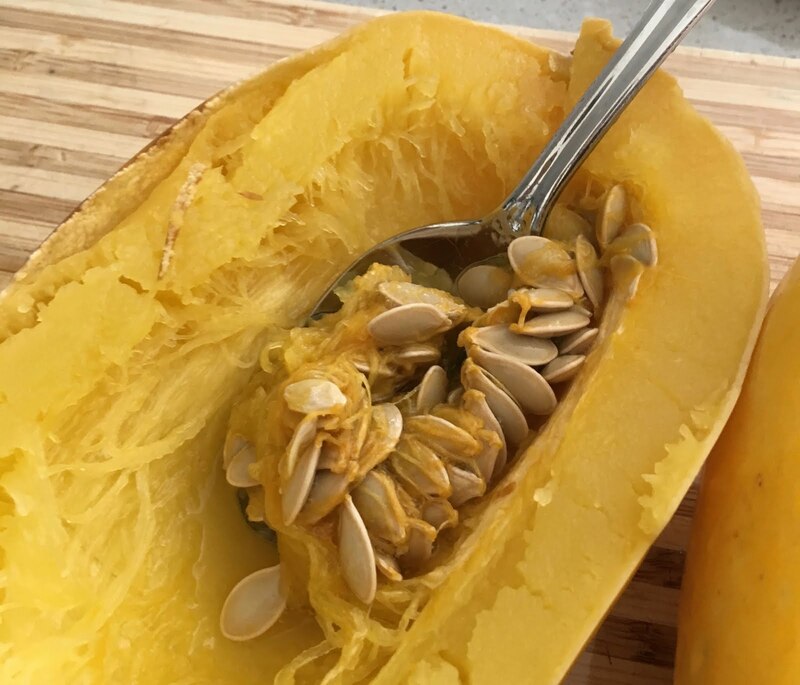 Spaghetti squash is also a great alternative to pasta, just top it with your favourite sauce and serve. 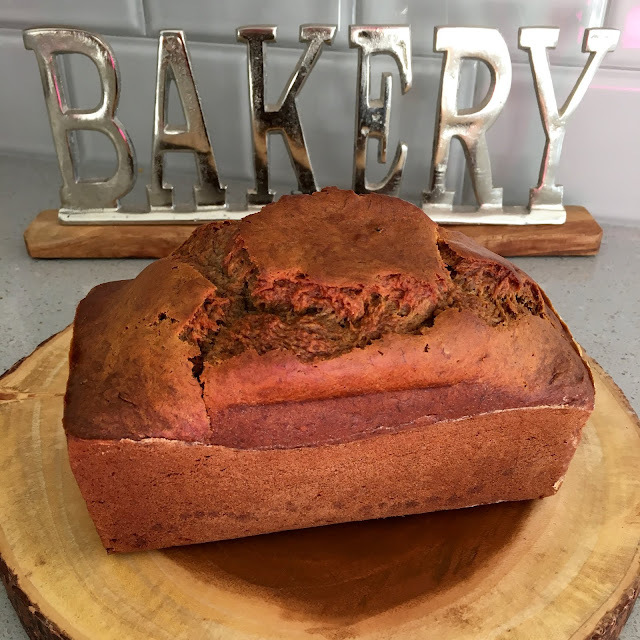 For this flashback I'd like to re-share a spiced pumpkin/chocolate loaf posted in 2008. I can't believe that's nine years ago! I switched up the photo on the original one as well and clarified the sizes of pans to use, so that it is easier to decide on the size of the recipe you wish to make. You can easily cut it in half to make only one loaf. This loaf is still as good as ever! Bake for 50 minutes at 350 F, until toothpick tests done. This dessert is perfect for fall, especially if you love pumpkin but can't decide between pie and cheesecake. 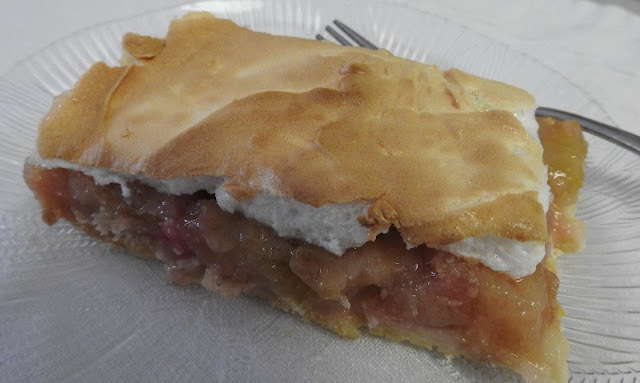 The texture and flavor are perfect with the creamy filling and crisp gingernsap crust. Combine all the ingredients and press into the bottom and 1 inch up the sides of a 10-inch springform pan. Bake in a 350 F. oven on the center rack for about 7 minutes or until the crust is fragrant. Remove from oven and cool while making the filling. Once cool, wrap the bottom and the edges of the pan in foil to catch any drips that might escape the pan. Leave oven on at 350 F.
Place a large pan of hot water on the bottom rack in the oven. Beat cream cheese in a large bowl with a mixer until smooth. Add sugar and flour and beat until smooth. Turn mixer to lowest speed add the vanilla and then five of the eggs one at a time, until all five eggs have been added. Measure 2 1/2 cups of batter and place in another bowl. To the remaining batter add the last egg and all the spices and the pumpkin. Stir slowly until combined. Put 1/2 of the pumpkin cheesecake mixture into the cooled crumb crust, then 1/2 of the vanilla cheesecake mixture and repeat. Do not swirl until all the filling has been added. Use a knife to gently swirl through the batter. Place the cheesecake on the rack above the water bath, not in the water bath. Bake for 20 minutes and then lower temperature to 300 F for about 60 more minutes. The cheesecake is done with the center is still a bit jiggly but almost set. I use an instant thermometer to be sure. Cheesecake is done at 150 F.
Turn off the oven but leave the cheesecake in oven with the door partly open for about 20 minutes. Remove from oven and run a knife around the edge to help keep it from cracking. Cool on a rack completely before chilling. Once it is chilled, wrap well and refrigerate until ready to serve. Cheesecake is best made at least one or two days ahead. I'll confess -- I enjoy baking much more than cooking, so if I can cook a meal with as little prep work as possible, I'm happy. This recipe is written as gluten free, but you can substitute your favourite pasta as you desire. Add rest of ingredients and cook until rice is done, about 20-25 minutes. 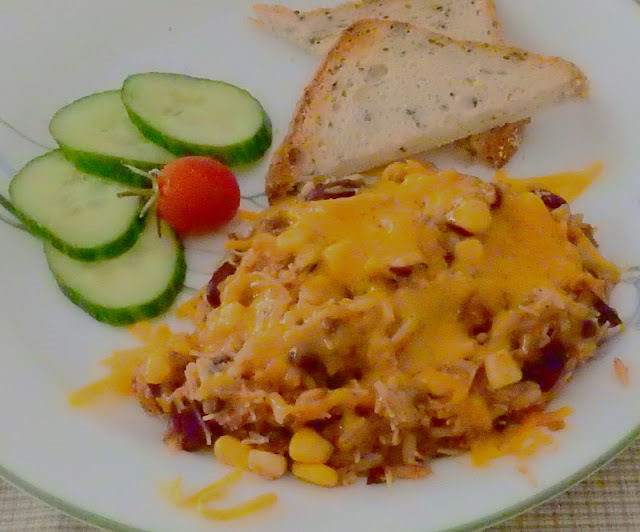 Serve immediately with grated cheese topping. Can be frozen for a quick meal when needed - or desired. Hazelnuts and pears make 'the perfect pair'. Combine them in these muffins and enjoy the taste of autumn! I served them to the 'corn harvest crew' on the farm recently, and they disappeared in a hurry. Cream butter and sugars until light and fluffy. Beat in eggs and vanilla. Combine dry ingredients and add alternately with buttermilk, mixing just until incorporated. Add diced pears and hazelnuts; fold into batter. Bake at 375°F for 20-25 minutes, or until toothpick inserted in center comes out clean. Cool for several minutes; then transfer to wire rack. 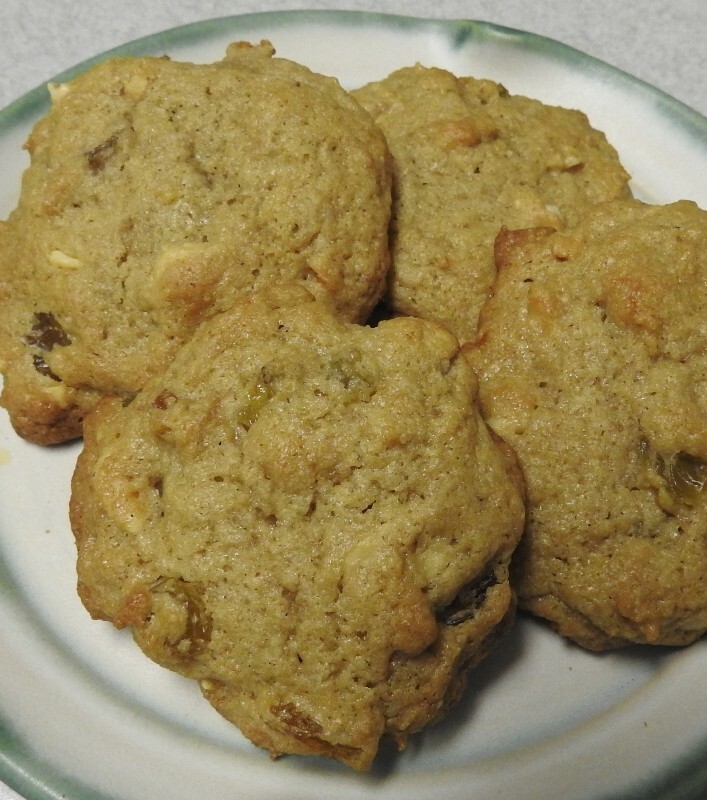 These Poblano halves are filled with a mixture of Blue Cheese, diced apples, and walnuts. The heat of the Poblano pepper adds a nice kick to these crunchy boats of goodness. Serve as a salad or an appetizer. You can increase the recipe if you'd like to serve more than two people. You can also leave the Poblano whole, cutting a slit in it when you remove the seed instead of cutting the pepper in half, then stuffing it with the filling. If you have a gas stove top you can turn one burner to medium and hold the pepper over the open flame with tongs, turning until all sides are blackened and blistered, make sure your oven fan is on. After roasting the pepper place in brown paper bag and seal the bag to keep the steam inside the bag. When it cools put disposable gloves on and take the pepper out of the bag. The peel should come off easily at this point, you can use paper towels to rub the skin off. After peeling it, cut a slit down one side and using your gloved hands remove all the seeds. At this point place on a paper towel and refrigerate the pepper till you are ready to stuff it. Another method is to roast the peppers under the broiler of your oven for 5 minutes. You can also use your outdoor grill to roast the peppers. Whichever method you use, don't forget step 2. Place the apples in a ceramic bowl and lightly coat them with the lemon juice. Combine the cheese and walnuts with the apples and toss. Cut the chilled pepper in half and place on top of a platter of salad greens. Fill each half of the pepper with the mixture of apples, walnuts and cheese. Whisk together the olive oil and red wine vinegar well and drizzle generously over the filled peppers. Tip: If you want to make more of these to serve 4-8 people you could roast 4 peppers ahead of time and keep them refrigerated until you are ready to serve these as an appetizer or salad. Just double the filling portion of the recipe. Happy Thanksgiving to all Canadians today! On this Thanksgiving weekend our thoughts are on family, those around our tables as well as those far away. I have thought about the benefits of giving thanks, believing that thankfulness turns our hearts to God and acknowledges our dependence on Him. Thankfulness shows we trust Him. A thankful heart strengthens our hope for the future and helps us bear the hard things. A thankful heart improves our well being on every level. Do you ever wonder what would happen if we stopped being thankful? If the sunset, the snow capped mountains, the rolling wheat fields or the vast expanse of ocean never touched our soul to whisper in awe? What if we never gave thought to the rhythm of our heart, how we fall asleep and how we wake? 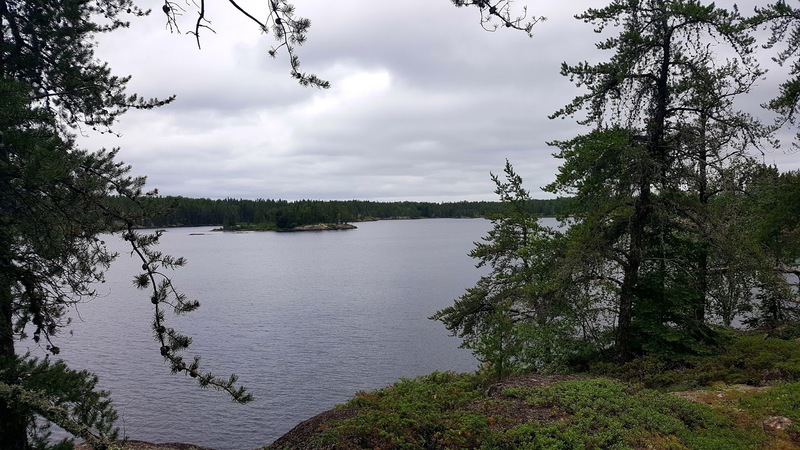 On our maiden cruise ship voyage we could not get over how wonderful everything was, when one morning we shared our breakfast table with a disgruntled guest. We tried to start a friendly conversation with her, but her discontentment about most things came through loud and clear. When we told her that we loved the food, she slowly and maturely told us, "Well, ya see honay, ya don't got notin' to compare it to ... but ... in actuality ... it really ain't good." Her words haunted me with a certain sadness, because they can be true to life for any one of us. We lose our sense of wonder. We get so accustomed to good things that we begin to compare or focus on wanting more. We can easily forget that what we have is really quite wonderful. A very long time ago, the apostle Paul wrote a letter to the Christians in Rome, explaining why God’s wrath was being revealed against the godlessness and wickedness of men who suppress the truth. He went on to say, “For although they knew God, they neither glorified Him, nor gave thanks to Him, but their thinking became futile and their foolish hearts were darkened.” (Romans 1: 21) It looks very much like the downward spiral in their quality of life began with ungratefulness. It's not that they did not know God, they just took him for granted. May our thankful hearts be a covering and blessing to the next generation to do the same. I received this recipe from a neighbor of mine many years ago. And I am sharing this with you again today. Just recently she called me and could not believe that her Mom, Florence's carrot cake recipe was on our blog post. It's fall time, and on this beautiful day, you can hear the tractors and machinery tilling up the land, planting winter wheat. What better treat than to serve a fresh piece of moist carrot cake loaded with almonds and a fresh cup of coffee? We don't know how long the weather will last. Soften butter, add cream cheese and blend until smooth. Add powdered sugar and spread on cake when cool. 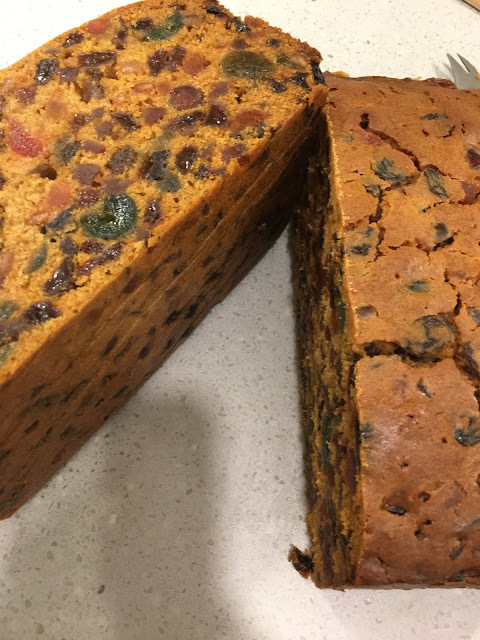 This cake becomes better with age and freezes so well. This cake will be going along on a road trip to visit family for Thanksgiving weekend. 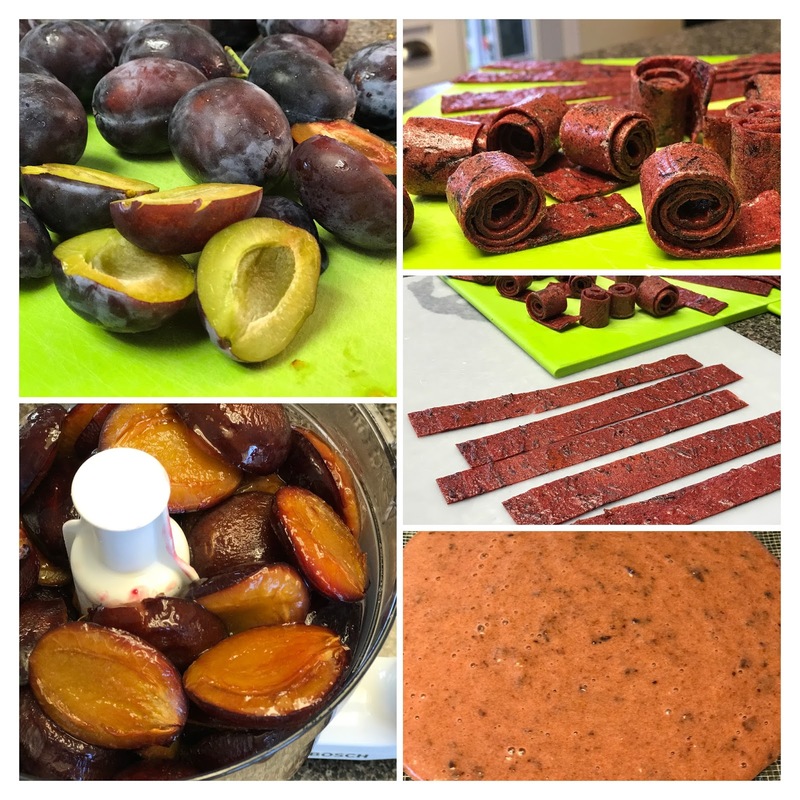 If you are still able to find some Italian Plums at your local market, and you have kids that love fruit roll-ups, this is a great way to make natural and healthy snacks. If you have a food dehydrator it is really simple but I also tested it in an oven and it works well there too. Wash, stem halve and remove pits from plums. Place the halved plums cut side down on a parchment lined cookie sheet and bake for about an hour at 325F or until very soft. Once they are cool enough to handle, transfer to a food processor and process until only flecks of skin are visible. Sweeten to taste. This really depends on the sweetness of your fruit and you may choose to not use any sweetener at all. I recommend using Silpat mats for the next step if you are using the oven to dry the fruit base, I have tried it with parchment paper but that tends to stick so if you are going that route, make sure you spray the parchment paper with cooking spray before pouring your plum base onto the sheets. Dry in the oven for 6 - 8 hours as low as the oven can go. 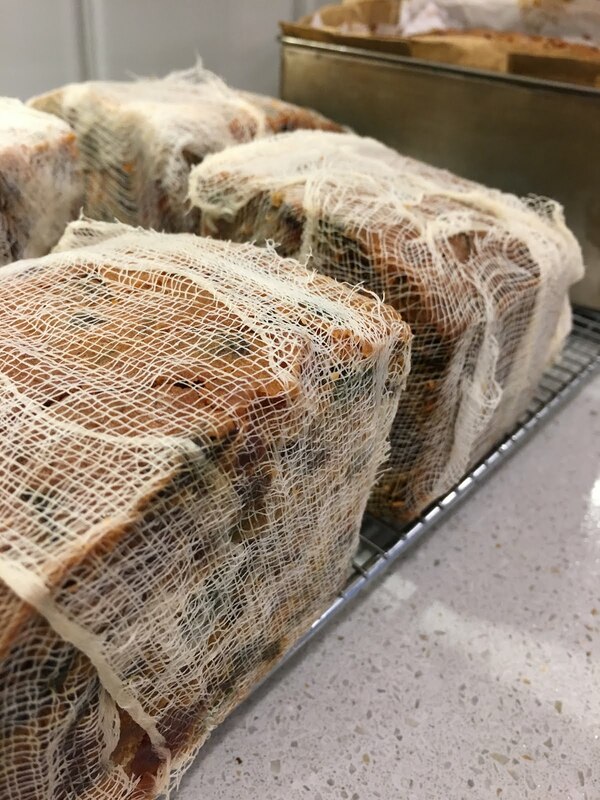 Between 170 - 200 F.
If you have a food dehydrator, line the screen racks with plastic wrap, making sure the edge of the wrap goes over the sides just slightly. Pour base onto the racks and turn dehydrator to medium. Check after 5 hours. Dry until the center of the fruit is dry to touch. Allow to cool completely, remove backing, slice into strips using a clean scissor or a pizza wheel. Roll up and store in a covered container. This is a wonderful noodle dish that our friends from the Philippines make. This recipe was given to me by my friend Cathy. We have enjoyed delicious dishes from the Philippines many times and this one is always on the table. I usually see it served in foil pans so I thought I should do the same. This is a large recipe, you may want to share or you can make half the recipe. Prepare noodles according to package instructions, drain and set aside. In a large pot or wok (on medium heat) add cooking oil and saute garlic and onion. Add onions, carrots, celery, cabbage, snow peas, and cook until vegetables are tender crisp, 5 to 10 minutes (depending on the size of your cut vegetables). Add chicken, chicken broth, and cooked vermicelli rice noodles (that were prepared and set aside) to the vegetable mixture until well combined. Stir in soy sauce, salt, and pepper. Continue cooking until liquid has completely evaporated. Serve hot. Serve with lemon wedges at the table, you can squeeze a little juice over your serving. Some may also like an extra splash of soy sauce. This recipe is from my sister. 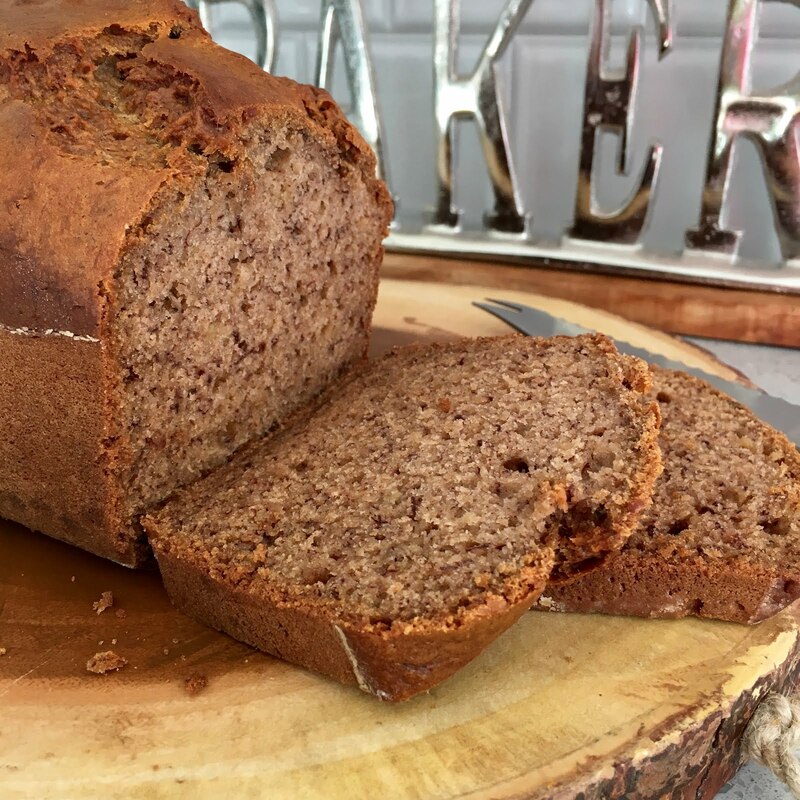 Just how banana bread should be...dark, moist and delicious. Measure first 4 dry ingredients into a bowl and stir to combine. Measure milk into small cup and add vinegar. Let sit for 2-3 minutes. In a separate bowl mash bananas and add to them the remaining ingredients. Stir the milk and vinegar mixture with a fork (it will have turned a bit thick) and add to the banana mixture. Beat until combined. Add dry ingredients to wet and mix until all the dry ingredients are mixed in well. Grease one loaf pan. Pour batter into pan. Bake in 325ºF oven for 60-70 minutes. If toothpick inserted into the middle comes out clean it it done. I'm not sure why this loaf bakes up with this interesting looking top when baked in a very old style bread pan. When baking it in a glass loaf pan it doesn't take on this look, but it is more smooth and may have a few little cracks on top and just nicely rounded. Good thing is they both taste the same once baked. Here in the Fraser Valley, it is starting to look like Fall. And with Fall comes the comfort of making soup. 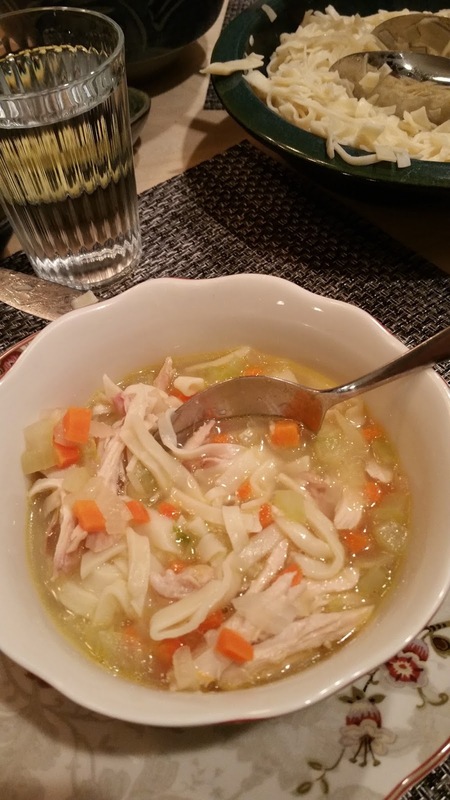 For my husband, the hands down favourite soup is this one. the best part is the homemade noodles. He is known to make one bowl of broth last for 3 bowls of noodles! Fill dutch oven or soup pot with water. Remove from heat and let cool briefly. Pour soup through a colander set over a large bowl or another dutch oven. Set in refrigerator until needed. Or divide broth into freezer containers and freeze for use later. In a cup, whisk together 1/4 cup water, the whole egg and egg yolks. Add liquid all at once to flour and mix until a medium stiff dough is formed. Add more water, one tablespoon at a time if needed. Divide dough in 2 or 3 portions. Roll out one portion at a time. 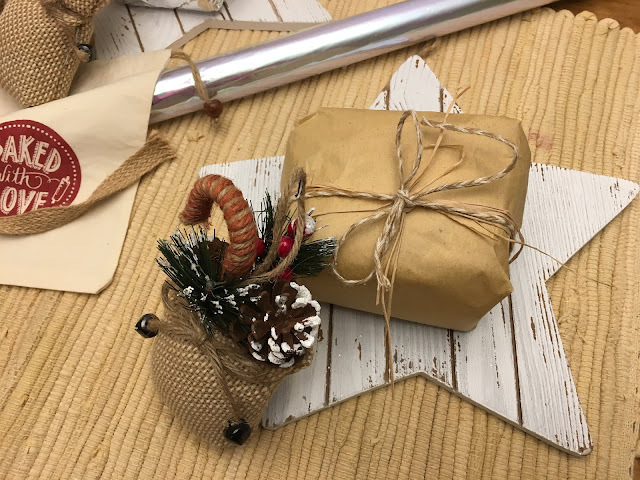 Wrap remaining portions and set aside until you are ready to roll them. On a lightly floured surface, roll the dough very thin. Lift the dough occasionally to allow it to relax before continuing to roll it. Don't worry if you end up with a few holes in the dough. Transfer rolled out dough to a clean tea towel and allow to dry for several hours. The dough should still be slightly moist for ease of cutting. Dust dough very lightly with flour and roll up to make a 1 1/2 inch diameter roll. 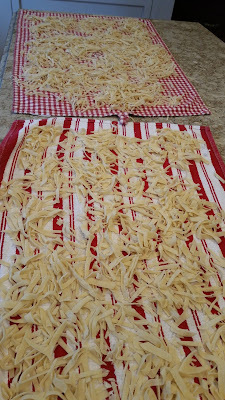 Lay it on a cutting board and cut noodles as thin or thick as you like cutting across the roll on an angle. Then cut across the roll on the opposite angle. Repeat until the roll is all cut into noodles. OR you can just cut long noodles by cutting straight across the roll. 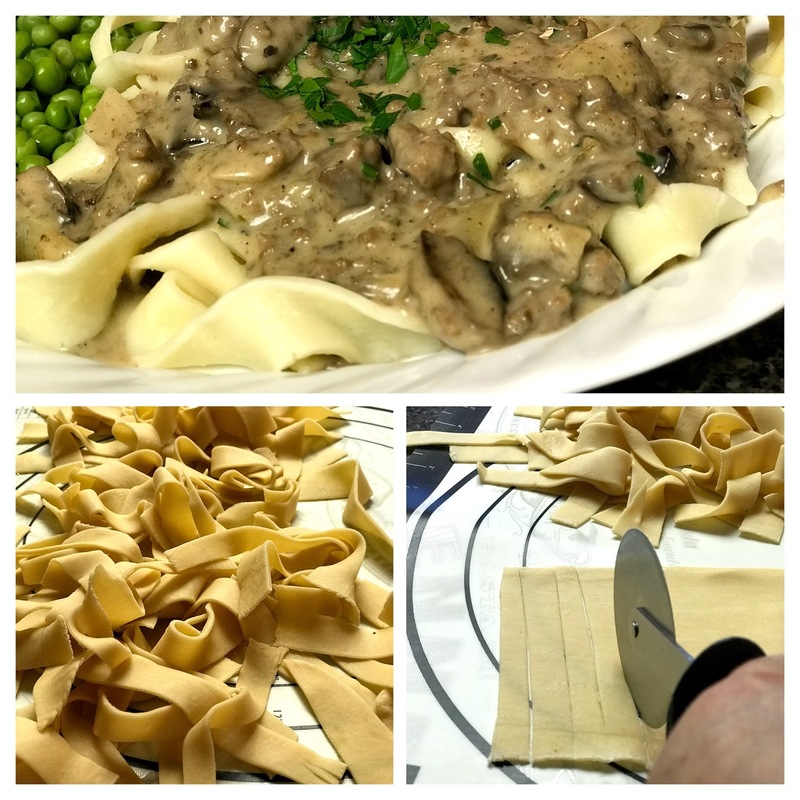 My Mother in Law cut her noodles on an angle so that is the way we do it. In large pot, place chicken broth, vegetables and chicken and bring to a boil. Adjust seasonings if needed with salt and pepper. In another large pot, place noodles in boiling, salted water and cook until just tender - about 5-7 minutes. Strain noodles and place in a serving bowl with a couple of tablespoons of butter. Toss lightly. Serve soup in a separate serving bowl. Let each person add noodles and soup to their own bowl as they prefer. Do not store leftover soup and noddles together in one bowl because the noodles will absorb the soup. Unfortunately, most of us do not know what comes our way. Recently, I've been thinking about the devastation left behind from hurricane Harvey and Irma. We see the ruins of Mexico as they have been hit with earthquakes. What about the refugees fleeing to Bangladesh? What about the most recent deaths in Vancouver this week? Can we still keep trusting in God and giving thanks? Many times we believe that once we've become Christians, nothing difficult will happen to us. God is not only there, but it's His plan - whether good or bad. During my difficult times, I keep thinking "God what are you trying to teach me?" There are times in our lives we've all experienced things we never imagined or expected. Can we really trust God in the midst of life's storms? woven into the tapestry of God's sovereign plan? I have definitely found myself in difficult situations, not knowing how to give thanks. I'm thankful today for a unique blessing that the Lord has brought individuals into my life to walk alongside me, who can understand my specific pain and bring comfort from God that they've also received in a similar situation. strength and comfort, trusting you. This piece of music continues to give me strength, as I meditate on God's sovereignty.